Get ready to see our solar cells where you wouldn't expect any at all. Their ability to function in diffuse light conditions, coupled with unprecedented possibilities of design, make them applicable to a variety of novel installations. 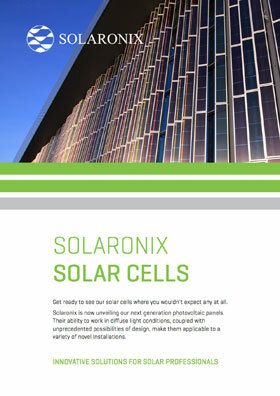 From building integration to embedded in electronics, the photovoltaic technology offered by Solaronix is full of potential yet to be explored. Building-integrated for solar energy used to mean rooftop installations. This is no longer true with our next generation photovoltaic panels. Available with a palette of different colors and adjustable transparencies, they are enough to make architects envision original integrations, with a natural emphasis on façades. Low light sensitivity and a smaller angular dependency allow our solar cells to work in vertical installations. The panels not only fulfill their technological duty by converting sunlight to electricity, but also become an integral part of the aesthetics of the building. Façade installations accentuate the dual functionality of our solar panels. First, a passive function: they reduce the need for indoor cooling by decreasing the amount of light entering the building. Second, an active function: a portion of the incident sunlight is converted to electricity, complying with the renewable energy concerns of modern construction, all without preventing the occupants from enjoying the outdoor views. 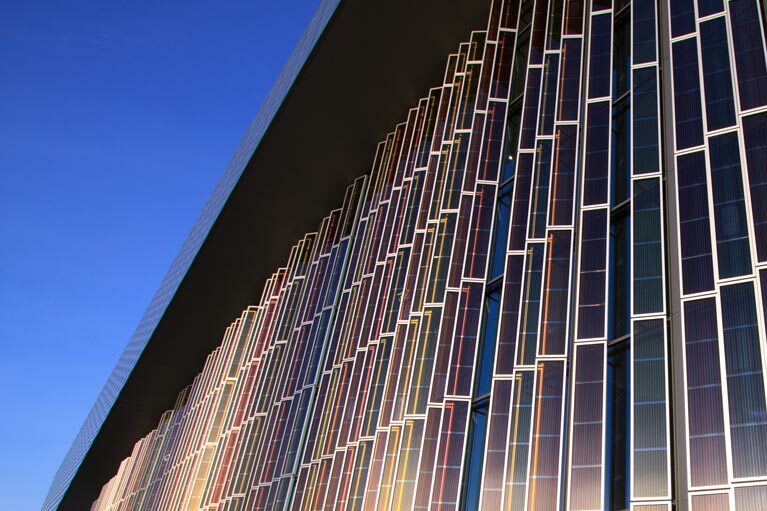 EPFL and the architects at Richter Dahl Rocha contracted Solaronix with an ambitious goal: combine a technology showcase with an ornamental façade. A year later the challenge has been met. The all-new SwissTech Convention Center hosts the world's first multicolored Dye Solar Cell façade. The 300 m2 installation, sponsored by electricity company Romande Energie, is installed on the vast south-west glass façade of the building, taking the form of ornamental verticals strips that complement the sublime architecture of the edifice. Five highly transparent color tones were chosen to meet the overall light transmission target, a prerequisite to prevent sunlight from overheating the majestic entrance hall. At the same time the façade lends a comfortable and natural light contribution to the interior. Mixed and matched, the color arrangement designed by artist Catherine Bolle gives a unique dynamic to the façadewhile providing a smooth color tone to the light transmitted into the hall. Energy collection was engineered from A to Z. With different angles, different panel sizes, anddifferent colors, all the panels were not created equally. To account for potential performance mis-matches between panels a microconverter is attached to each panel. These microconverters use maximum power point tracking technology to ensure that each panel's electrical production is optimized for the light conditions. The electricity that is produced is collected along an energy backbone before being inverted to AC power. This ingenuous system also allows us to implement remote monitoring of each individual panel in the façade to facilitate maintenance and learn about a real-world installation. There are many reasons a device should be energetically self-sufficient. Remote locations do not always allow for grid connection and mission-critical applications may need backup power for safety and redundancy. Solar energy is naturally a good fit for these situations, with the net advantage of reducing the environmental impact of power generation. Many applications do not have access to direct sunlight. Our photovoltaic panels function in diffuse and relatively low light conditions, including indoors. What's more, their colors, transparencies, and shape can be tuned to specific conditions and applications. This unique set of features makes them easily embedded in all sorts of self-powered devices. The solar cells can be discrete, blending in with the device's exterior, or ornamental, showcasing that the device is solar powered. The EPFL campus was searching for luminescent furniture that would light up at night. The furniture needed to be easily relocated, adaptable to different configurations of the public square for various events throughout the year. Conventional wiring wouldn't provide such a level of flexibility, so the furnitures ought to be energetically self-sufficient. A bench than houses solar charged batteries appeared as a desirable solution,but how do you enable solar power on a bench? People sitting on the bench might block sunlight from reaching the solar cells. Another challenge accepted by Solaronix. The bench, designed by Paysagestion, cleverly uses a translucent shell. Although it looks white and opaque from the outside, it nonetheless allows diffuse light to reach the internally mounted solar panels. Thanks to their ability to work in diffuse light, the panels can collect energy and recharge internal batteries during daylight. At night, the energy stored in the batteries is used to power a lamp that illuminates the shell. The luminescent benches are easily found in the dark, offering a unique and futuristic backdrop to the public square. Solaronix developed the sophisticated energy management system for the benches from the ground up. The benches can be programmed to light at specific hours and for a predefined duration, as dusk varies with seasons. Each bench has an internal clock that is regulated by the atomic radio clock, allowing the 12 benches installed on the public square to light up at the very same moment, in spite of being completely independent. The benches are fully autonomous in terms of power, time accuracy, and programming. Portable electronic devices have become sindispensible to our everyday lives and inspire the same wish in all of us… we all wish their batteries would last longer! If there is one source of power that's ubiquitous, it is certainly light. Thanks to modern micro-electronics and 3rd generation PV technologies portable devices are beginning to tap ambient light as a power source. Perhaps you've already seen solar-powered keyboards, solar chargers, and solar backpacks. These are examples of how solar powered electronics can enhance our modern life to make it even more comfortable. Being able to juice up our portable devices while on the go is a situation we have all wished for countless times. Sure external batteries exist, but that just shifts the hurdle one stop away. The following charger uses our solar cells to charge its own battery while idle, and will in turn charge up devices whenever necessary. Thanks to the low-light performance of our solar cells, the battery can be charged indoors or outdoors, it's no longer necessary to deliberately place the charger outdoor in direct sunlight. Since the design of our solar cells can be easily adapted, there's no compromise between aesthetics and utility.